This tractor is retired. It’s reached it’s golden years and no longer works long hours each day. After a lifetime of hard work, it feels a little lost if it has nothing to do. So it does a few odd jobs here and there. 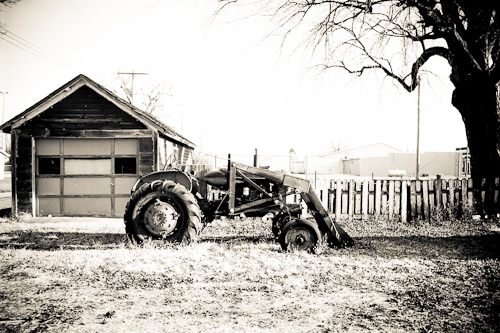 This entry was posted in Uncategorized and tagged copyright ryan ware, fence, garage, tractor, yard. Bookmark the permalink. Ryan, you have such an ability to capture the heart of rural life. Another excellent image, enhanced by your photo editing skills. I like the strong horizontal lines repeated in the garage door, the tractor and the fence. Well done. Thanks, Audrey. I was just driving by and that tractor sitting there caught my eye and I had to take a picture. The tractor is a city dweller (small town) which goes to show how in rural areas the country is woven into the city. Or perhaps like some retired farmers it has relocated to town in it’s final years.